For many years, the American Schooner Association has been compiling a database of schooners located in the US and Canada. That database has grown to approximately 450 schooners, scattered all around North America. While we feel we have been reasonably successful finding schooners, we know we are missing many, particularly undocumented privately owned and Canadian vessels. We know they are out there and we need your help finding them. This is a project for crowd sourcing if ever there was one! Please help us find the missing boats! 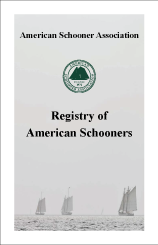 The current version of the Registry of American Schooners is available Here. The directory has an active table of contents. Click on the schooner name and you will jump right to the page on which the boat is listed. If you own a boat, please take a look at the Registry. If your boat is there, please send us an email at registry@amschooner.org. We will send you a vessel information form that you can review and return to us, updating information as needed. If your boat is missing, please get the information to us! Download the boat submission form. The form is an interactive Adobe form. Just type in the information and submit your information to us. Instructions are on the form itself. If you know of a boat that isn’t listed, please let us know about the boat with an email to registry@amschooner.org. Any information you can supply, particularly home port, would help us locate information about the boat. If you know the vessel owner, please pass this along to them as well! The Registry is being created as a public resource to the schooner community and is available to anyone for personal and non-commercial use. The Registry is a copyrighted product of the American Schooner Association and subject to all applicable copyright laws. You may not download, print and sell the Registry. Ultimately we will be creating a web site dedicated to the Registry, which will allow direct access to the Registry database. Please help us make the Registry even more useful by working with us to “fill in the blanks” in the database!